Well, it wouldn't be the playoff season if the Pittsburgh Penguins weren't subjected to terrible news on the injury front. The team announced this morning via its twitter account that Marc-Andre Fleury would not be making the trip to Brooklyn as the Penguins take on the Islanders. To make matters worse, it's due to Fleury having a concussion, an injury that Pens fans know all too well has no time line for getting better, only a wait for the symptoms to subside. It could be a short term injury that sees him back in the net before the postseason starts, but it very well could take longer for him to get healthy. Until he's better, the team will need to turn to backup Matt Murray to man the net, and while Murray has posted impressive numbers in limited time this season, not even the most ardent Murray supporter would argue for him to start in the postseason barring injury. For a team that's been streaking lately and picking up key injuries at an alarming rate, the question is simple - can Matt Murray handle the playoff load? When the Penguins drafted Murray in the 3rd round of the 2012 draft, they likely never imagined that Murray could be in a position to see such significant action so early in his career. In fact, it was Tristan Jarry who had been viewed as the goalie of the future after Pittsburgh traded up to draft him in the 2nd round of the 2013 NHL draft. But a funny thing happened after the team took Jarry - Matt Murray started catching fire in net. As a 19 year old in his final season junior hockey, Murray posted a 0.921 SV% and 2.57 GAA with the Sault Ste. Marie Greyhounds in 2013-14 despite not topping a 0.900 SV% or posting better than a 3.50 GAA in his previous three seasons. In fact, when he was drafted, it was the 6'4" Murray's height and athleticism that drew the eyes of the Penguin scouts, not his results on the ice. 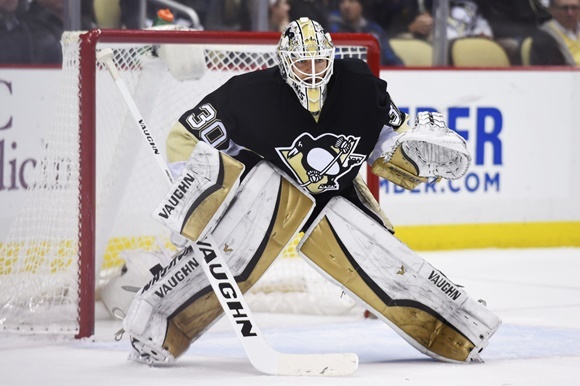 Murray would sign a three year entry level contract with the Pens following that season, and he reported to the Wilkes-Barre Scranton Baby Penguins, where he would split time to start the season with Jeff Zatkoff. And while Murray would have a respectable start to his professional career, posting a 0.912 SV% and 2.20 GAA in the 2014 calendar year, 2015 would propel him onto the career course he's on today. Murray's second half would be one for the record books, and his 0.956 SV% and 1.20 GAA in 27 games would win him the Baz Bastien Memorial Award as the AHL's best goaltender, the Harry Holmes Memorial Award as the AHL's best goaltending duo, and the Red Garrett Memorial Award as the AHL's rookie of the year. Along the way, Murray posted 10 of his 12 shutouts during the 2015 calendar year, and set an AHL record with a 304 minute, 11 second scoreless streak. His breakout season would spark a conversation of where he should be playing for the 2015-16 season, but the Penguins decided to keep him in Wilkes-Barre instead of bringing him up to backup Fleury. Jeff Zatkoff did get the promotion, and it opened the door for Murray to be the unquestioned starter in the AHL. Murray responded with another stellar stretch of play, with a 0.944 SV% and 1.52 GAA before the Penguins recalled him in December when Fleury suffered an earlier concussion. It was another big test for the young goaltender, and he would pass with flying colors. In his 4 starts, Murray would post a 0.938 SV% and 1.72 GAA average before being sent back to the AHL. It wouldn't take long for Murray to be back up in the NHL as Zatkoff struggled to carry the load as Fleury's backup, and the team recalled Murray shortly before the trade deadline, and for the second straight season he pushed Zatkoff further down the depth chart. Murray has now started 8 games on the season and has generally played well during his time in Pittsburgh with a 0.926 SV% and 2.09 GAA. These numbers are even after his first struggle at the NHL level, giving up 4 goals on 30 shots in a 5-4 shootout win against the Buffalo Sabres this past Tuesday. Murray has stepped up to the challenge at every level as his career has progressed more rapidly than anyone could have possibly imagined, but is he ready to not only handle NHL action, but potentially NHL playoff action? While the sample size is far too small to get any definitive answers, it does offer some hope for Murray being able to step in and hold down the back end. Murray has posted a higher save percentage than Fleury at even strength (0.944 vs 0.933) and shorthanded (0.881 vs 0.877), and Murray's adjusted save percentage is a very high 0.950 on the season. He's posted better save percentages at the high danger, medium danger, and low danger levels as well. This isn't to suggest that he's a better goaltender than Fleury in the least, or that he's going to maintain these numbers, bu they offer promise that Pittsburgh will continue playing at a high level in Fleury's absence. Nobody knows how Matt Murray will fare if he is forced into action during the NHL playoffs, but he's far and away exceed expectations up to this point. In fact, his impressive play has been enough to make Team North America for the upcoming World Cup of Hockey. He's handled NHL action well up to this point, but as teams are able to get more game tape on him it'll be interesting to see how Murray is able to respond. A situation like this is exactly why it was so important for Murray to get starts at the NHL level, and now it's uncertain how much of the Penguins' season could rest on his shoulders. If Fleury misses significant time, it'll be up to Matt Murray to once again take his game to a higher level if Pittsburgh is going to make a deep run.